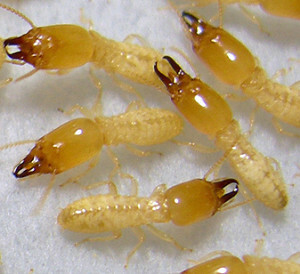 Invasive subterranean termites cause property damage in many regions. Understanding their behavior is the first step in eradicating these pests. Subterranean termites live in underground colonies, where they stay busy building tunnels in search of wood and other foods containing cellulose. Eastern subterranean termites are just one of the more than 2,300 termite species described worldwide, while subterranean termites as a group are one of three termite types. Eastern subterranean termites are the most common termite species living in North America. They are widely distributed throughout the Eastern United States, though their range is from Southern Ontario all the way south to Texas. A mature colony has between twenty thousand and five million workers, and the colony’s queen continually adds to the number, laying between five and ten thousand eggs annually. Subterranean termites, including Eastern subterranean termites, are social insects. They share resources, divide labor, and care for their queen and her young. These termites live according to a caste system which includes both males and females in each specific caste. Worker caste termites are just about three millimeters long. They have soft bodies and a round head, and are creamy white to grey in color. They are blind, wingless, and sterile. Their lot in life is to construct and repair underground shelter tubes, forage for food and water, feed and groom the other termites, and care for the queen’s eggs and help rear the colony’s young. The worker termites eat much more wood than soldier and reproductive termites do; this is not at all surprising considering the amount of labor they do on a daily basis. Soldier caste termites closely resemble worker caste termites, but instead of round, nearly featureless heads, these termites have long, black jaws protruding from large, rectangular brownish-yellow heads. Eastern subterranean soldier termites are also equipped with a gland on their foreheads which emits sticky latex. Soldier caste termites spend their time defending the colony against ants – their most common natural enemies. While all subterranean soldier termites use their jaws to crush ants, the Eastern subterranean soldier termites use the latex they produce to ensnare their enemies, as well. Soldier caste termites are unable to feed themselves. They rely on worker termites for food; the workers carefully regurgitate partially digested cellulose, which they then feed to the soldiers. Reproductive caste termites are about one centimeter long. They have dark skin and a pair of antennae, along with two pairs of equally sized wings which they shed after taking their nuptial flight, settling into a new colony, and mating. If you see lots of wings in a specific area and no insects to account for those wings, you can almost be certain that a new colony of termites has taken up residence nearby. Swarming occurs during daylight hours between the months of February and April, though swarms occasionally develop during the autumn months. Eastern subterranean termites are opportunistic insects. They are capable of developing into any caste after hatching, and when they develop into workers, these workers are capable of molting and becoming soldiers. Some newly hatched Eastern subterranean termites become alates, which are nymphs with the potential to develop into winged reproductive adult termites or to revert to worker termites. While subterranean termites, including Eastern subterranean termites, do benefit natural ecosystems by ensuring natural organic matter decomposes in a timely manner, they can cause costly damage to homes and other structures. If you see these termites around a structure or living nearby, you should rapidly locate the colony and take steps to eliminate the infestation.